Back to school means back to brown bagging it, but this autumn the brown bag comes in a variety of eco-friendly options. Green foodies, or groodies – and any of us who perpetually intend to take our lunch rather than buy it - can choose from an array of colourful, stylish reusable bags and totes to transport their gourmet lunch goodies to school or work. Try our new Munchlers – insulated, soft-sided lunch boxes that unzip into a placemat, all in the shape of a zoo animal. 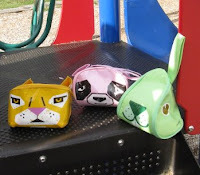 Choose from Benny the tiger, Boo the pink panda or Meadow, the green rabbit. Great for ages 3+ through elementary school. Older kids – and adults too – will love our Gourmet Getaway lunch totes that have just arrived. Made of neoprene, the wetsuit material, these bags have a sturdy zip, insulate hot or cold food and drink for up to four hours and stretch to fit any combination of stacked containers and food items. The options are out there. Now, it’s up to us. Think about buying green bags rather than brown. View our complete selection of eco-friendly lunch carriers and 100% recyclable water bottles at Lavish & Lime.